If you have grown up in a traditional Hindu family, attaining marriageable age comes with a whole new vocabulary. If you find yourself losing it over terms like kundli, rashi, lagna, etc., don’t get worked up - we are here to help you out! Here’s our guide to basic Hindu astrology (Jyotisa) to save you from all possible stress. Is Your Kundli Confusing You? We are sure you have heard this before. Thanks to Bollywood and TV soaps, we are more or less familiar with the word kundli. The harrowed mother-of-the-bride wailing in despair because the daughter’s kundli does not match with the prospective son-in-law’s - yeah, we know, happens every day on the telly. So what’s with all the fuss? Let us take you through! Kundli (or kundali) refers to your horoscope or star-chart. In Hindu astrology, planets and the houses they inhabit at a certain point plays a significant role in determining one’s fate or destiny. The kundli maps out the position of the 7 planets, the sun and the moon at the time of your birth. You birthday, the time of birth and the place of birth are essential for your horoscope. When it comes to matchmaking, kundlis of the couple involved are compared to check compatibility. Your kundli is also used to determine auspicious times (muhurats) when certain rituals can be performed (like marriages, rice ceremonies, pujas, etc.). Now that you have been through the taxing part of understanding what a kundli is, getting one made will be a breeze. You can get your kundli made by just providing your birth details mentioned earlier to an astrologer, or log on to online sites (such as this one), which generate horoscopes with the same details. Make sure that your time of birth is precise to the exact second. That’s all you need to do. We told you it would be a cakewalk! Okay, now that we've got you going, let's work towards turning you into bit of a pro. Enter lagna. One's lagna is the degree of the rashi (or sign) which is rising on the eastern horizon at the time of one's birth. Breathe girls, it is not as complicated as it sounds. Simply put, lagna (or ascendant) is the first moment of contact between the newborn and life on earth. 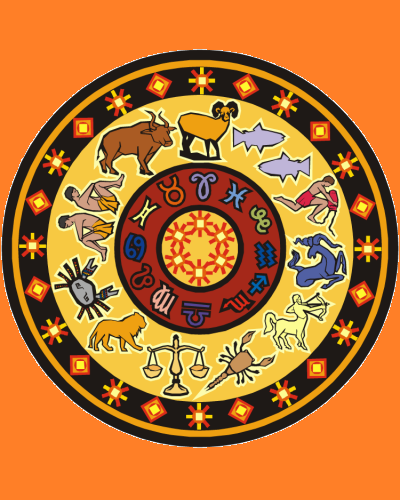 This "rising sign" is taken as the first house of the horoscope, and the other houses are charted in sequence through the rest of the signs of the zodiac. My Kundli Is My Destiny Document. Why Should I Bother about My Lagna? True, your kundli is what provides a window to how your life will shape up. But your lagna is important too. Your lagna provides clues about the guiding traits in your life. It is the only aspect that will never change on your astrological chart, while celestial bodies will move around and mess with you. Hence, in Hindu astrology, it is believed that your fate is decided at birth, all thanks to your lagna. The next time you gaze at stars, thinking about a loved one, be aware that you are basically gazing at your future. 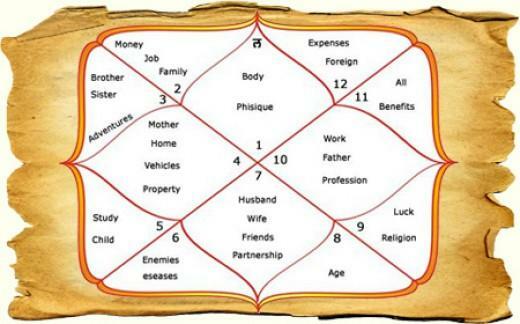 Rashis are basically the jyotisa equivalent of the twelve signs of the English zodiac we are more familiar with. It differs though from the English zodiac system as one’s rashi is determined by your star-chart, and not just you birth date or month. The rashi is called the ‘moon sign’ as it is believed that this is where the moon is present during the time of your birth. Every rashi is ruled by a planet, the sun or the moon. Based on these, every individual inherits a basic persona or characteristic which plays an important role in one’s life. As the moon moves from one sign to another, it affects changes in one’s life. Here’s a list of the rashis and their ruling planets: 1. Aries (Mesha) is ruled by the house of Mars (Mangal) 2. Taurus (Vrishabh) is ruled by the house of Venus (Shukra) 3. Gemini (Mithun) is ruled by the house of Mercury (Budha) 4. Cancer (Karka) is ruled by the house of the Moon (Chandra) 5. Leo (Simha) is ruled by the house of the Sun (Surya) 6. Virgo (Kanya) is ruled by the house of Mercury (Budha) 7. Libra (Tula) is ruled by the house of Venus (Shukra) 8. Scorpio (Vrischika) is ruled by the house of Mars (Mangal) 9. Sagittarius (Dhanu) is ruled by the house of Jupiter (Guru) 10. Capricorn (Makara) is ruled by the house of Saturn (Shani) 11. Aquarius (Kumbha) is ruled by the house of Saturn (Shani) 12. 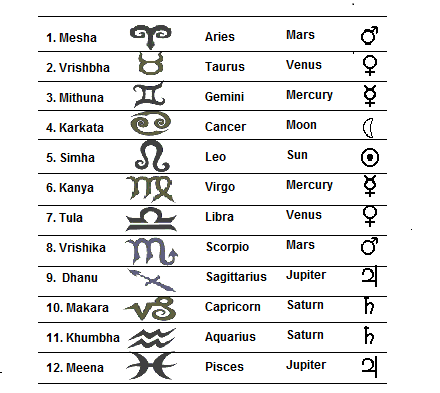 Pisces (Meena) is ruled by the house of Jupiter (Guru) Well, this was your crash course in basic Hindu astrology. We would advise that you leave any other nitty-gritties to your astrologer as jyotisa is a fairly complex subject. But we can’t do without giving you some added info, can we? Read on! Maybe it was Aishwarya Rai, or the second cousin who recently got married, you must have come across the word manglik, right? While we leave it for you to decide if you are bothered by it, we will definitely tell you what all the brouhaha is about. To begin with, let us get over with the technical stuff. In jyotisa, mangal dosha is an astrological combination that occurs if Mars (Mangal) is in the 1st, 2nd, 4th, 7th, 8th or 12th house of the ascendant chart. A person born in these houses is called a manglik. There is no definitive view on this, but being a manglik is considered to be a bad thing. Basically, if you are a manglik, your relationships are said to suffer. It’s believed that if two mangliks marry each other, they cancel the negative effects. If a manglik wants to marry a non-manglik they have to perform a kumbh vivah, in which the manglik has to marry a banana tree, a peepal tree, or a silver or gold idol of Lord Vishnu. The choice is yours! There you go! Now that you have it figured out somewhat, get going on your horoscope and gear-up for the nuptials! MUST-READ: #Numerology101: What Your Birth Number Says about You MUST-READ: What Is Your Star Sign’s Personality? Here’s a Quick Guide!